St John Vianney's Primary School prides itself on being an inclusive school where all children are welcome. We are a vibrant and welcoming community with an importance of having Christ as our centre. At St John Vianney's we continue to strive to ensure all children can meet their potential whatever their abilities or invdividual needs. St John Vianney's community fully support the Catholic philosophy and values, and aim to instill these in our teachings. Children and families who are prepared to support Catholic ideals and principles are considered eligible for enrolment. Children from non-Catholic backgrounds are welcome; acceptance may depend on vacancies and local policies. Enrolment applications for all year groups are welcomed throughout the year. St John Vianney's has an orientation morning in Term 4 for children starting Kindergarten in the following year, an information session is held for parents at this time. Children in other year groups are welcome to have a familiarisation day prior to commencment. 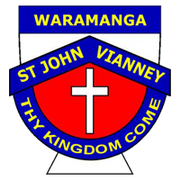 Information about St John Vianney's can be found in our Parent Information Booklet, or please contact the school on 02 6288 2383 or office.sjv@cg.catholic.edu.au.